This is according to data released by the Central Pollution Control Board (CPCB) Monday, which showed that the air quality in 2018, so far, has improved compared to 2017 and 2016. The 118 days of satisfactory to moderate air quality in 2018 were five more than 2017 when 113 days ranged from good to moderate while only 74 days showed a similar trend in 2016. Between January 1 and August 26, there were 118 days when the air quality index (AQI) in Delhi hovered between satisfactory or moderate; 120 days were designated between poor and severe and a sharp spike in particulate emissions was recorded in June. 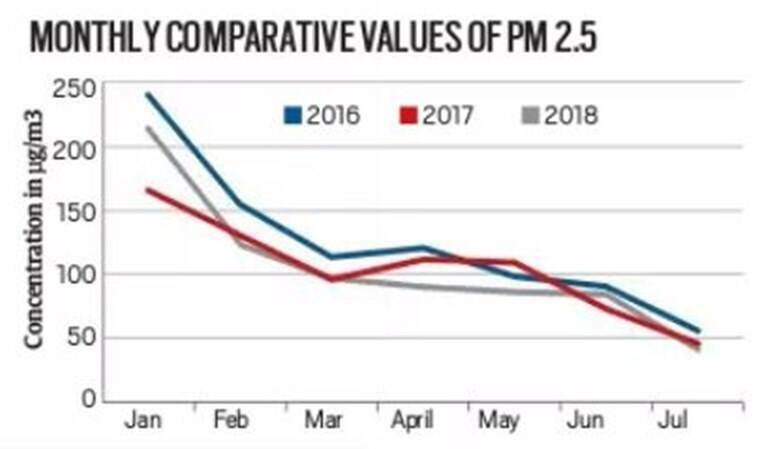 This is according to data released by the Central Pollution Control Board (CPCB) Monday, which showed that the air quality in 2018, so far, has improved compared to 2017 and 2016. CPCB officials said that the improvement in air quality followed a slew of measures initiated last year including the Graded Response Action Plan (GRAP) and better coordination between multiple agencies in the National Capital. Days marked poor, very poor and severe on the AQI have also consistently decreased over the last three years – 153 in 2016, 125 in 2017 and 120 so far in 2018. The AQI which is based on Indian ambient air quality standards is an index that considers pollutants like sulphur dioxide, nitrogen dioxide, particulate matter (PM10, PM2.5), ozone, lead, carbon monoxide and ammonia. The CPCB data also showed that over a four-day period in June, there was a significant spike in particulate matter compared to previous years, owing to dust storms from Western India that originated farther away in Oman. On June 13, for instance, the PM10 concentrations touched 835 micrograms per cubic metre (µg/m3), while PM2.5 touched 282 µg/m3. Gargava also warned that more needed be done for a “substantial improvement” and that it was hard to pinpoint any one particular activity that has contributed most to better air quality. “It is a cumulative effect of ground actions initiated by the Graded Response Action Plan (GRAP) that tackles sources such as road dust, construction dust, open burning and vehicular pollution,” he said. The GRAP is a November 2016 Supreme Court-mandated air quality plan, which directed agencies to draw up an action plan during air quality emergencies. “There are multiple reasons responsible for better air quality days this year and it also depends on meteorological conditions. For instance, the effects of the ban on petcoke in Delhi and NCR will likely be seen only this winter,” he said. Better multi-agency coordination is also cited as a major reason for bringing down air pollution levels. The Centre in the Lok Sabha had said that other measures like the comprehensive action plan put in place by the Ministry of Environment and Forests, strict action against construction activities, surveillance of coal-fired plants, and task forces set up on the ground by the CPCB has helped curb pollution levels. Anumita Roychowdhury from the Centre for Science and Environment (CSE) told The Indian Express that air pollution levels deteriorated in winter and that the last year was comparatively better than the year before.